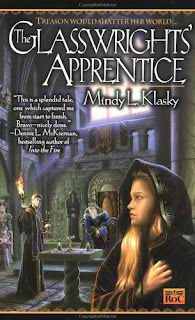 The Glasswrights' Apprentice is the 1st novel out of 5 in the "Glasswrights' Guild" fantasy series by Mindy L. Klasky. Klasky is also the author of the "Jane Madison" series, which starts with Girl's Guide To Witchcraft (2006). 13-year old Rani Trader is a daughter in a typical merchant's family, but is currently serving as an apprentice in the Glasswrights' Guild; a guild higher in society than that of the Merchants' Guild, and one that promises future riches and higher respect for Rani and her family. When Rani is conspiratorially blamed for the death of the kingdom's successive prince, she has no choice but to flee for safety; not only because she was recognized at the scene of the crime, but also because her guild is being blamed for the prince's murder. On her quest to prove that she is not personally guilty for the prince's death, Rani manages to make allies with other guilds and caste systems in her kingdom, but at the same time is presented with the difficult task of determining in whom she can sincerely trust. Soon enough, Rani learns of a secret, deadly, and horrific brotherhood in the kingdom - a brotherhood on a mission to kill everybody in the royal family. The Glasswrights' Apprentice is fantasy in the sense that the world, society, religion, and caste systems in the novel are fantasy - there are no crazy dragons, goblins, or other types of mythical and mystical beings. The novel has a very medieval feel to it, and is action-packed from beginning to end as Rani runs from the king's soldiers and members of the brotherhood. The story and plot of The Glasswrights' Apprentice is highly creative and crafty; resulting in an indelible experience you'll be dying to share with other readers - even those who don't typically enjoy the fantasy genre. This novel will keep you on your toes and in a page-turning trance from start to finish. Since Rani is only 13 years old in The Glasswrights' Apprentice, scenes that contain violence and sexual undertones appear to be softly muted and lack intensity; but as a reader, you can't help but hunger for more explicit detail in these areas. Klasky also seems to have targeted young adults and teens for this book's audience, so with that said, I'm hoping the next 4 books in the series become progressively more intense! My only struggle while reading The Glasswrights' Apprentice was my inability to comprehend some of the speech patterns practiced by the lowest caste known as "Touched," a group that speaks in some weird version of English cockney (or whatever this type of lingo is called). With the odd spelling and linguistic phrasing, my reading was slowed down significantly for the sake of comprehension, but other than that small gripe, I loved this novel! Fans of all fantasy sub-genres - men and women alike - will love The Glasswrights' Apprentice. Readers who typically avoid the fantasy genre will also enjoy this novel, especially those that enjoy a good conspiracy plot, political uprisings, and mysteries. I've already got book 2 of this series on my bookshelf, waiting to be read. I purchased the book within a week of finishing The Glasswrights' Apprentice, meaning I am legitimately excited to read it. The remaining books in this series are: The Glasswrights' Progress (2001), The Glasswrights' Journeyman (2002), The Glasswrights' Test (2003), and The Glasswrights' Master (2004). Click on the images of any of the books below to review them in more detail on Amazon.com. 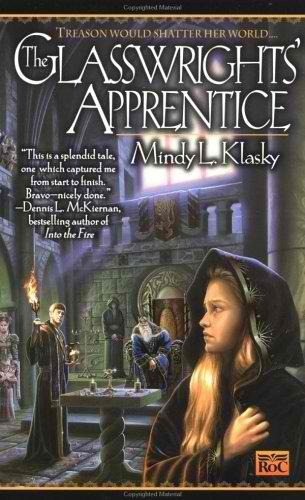 Have you read any novels by Mindy L. Klasky, and if so, which ones? What are your thoughts? So would you recommend for a 12 yr old girl? It sounds great, but the lower caste dialect makes me wonder if she's struggle with that part of it. Sounds like one I'll like, too!